Everyone knows that Costco is a bastion of wholesale savings, but those that haven't spent much time inside its cavernous 150,000sqft warehouses might not know that the savings aren't the only thing that's supreme. That's right, we're making pizza puns. That's because Costco has also mastered pizza. The megastore's pepperoni, cheese, and supremely loaded combo slices have earned a cult following for quality, insane calorie-to-cost ratio, and a mesmerizing mechanical saucing process. The folks at Costco gave us a rare behind-the-scenes tour of their kitchen to show how the sausage (pizza) is made. 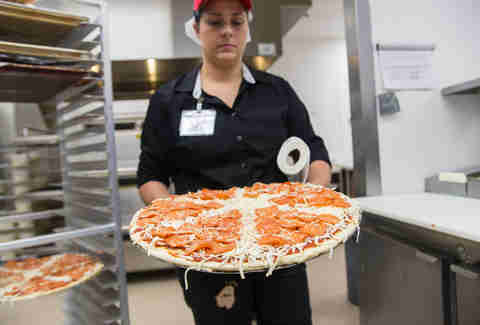 We learned that each slice is well worth the $2.15 (after tax! ), especially when you consider the chemistry, robotics, and economic planning involved. Meet Mary Coy. Mary's responsible for helming the kitchen at Costco #681 located in Austin, TX. She bakes anywhere from 150-200 freshly made pies for customers every day, sold at prices that align with Costco's philosophy of low markups (14% compared to most retail's 30-40) and emphasis on quality products. One way Costco keeps those prices so low is by locking in its cheese prices several years in advance in order to avoid market fluctuations. Costco knows the cheese market, probably better than your broker knows the NASDAQ. New York pizza fanatics will claim that the city's signature water is a crucial ingredient in the dough. Costco agrees. 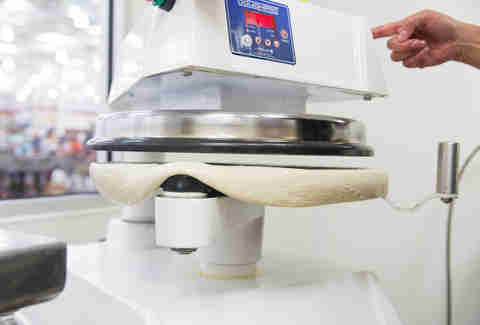 It purchases its dough from a Brooklyn-based distributor who delivers it daily, then it rests and proofs before being layered in olive oil (power fact: Costco is the world's largest retailer of olive oil) and loaded into a flattening machine that presses it with 130 degrees of heat for seven seconds to ensure a uniform thickness. 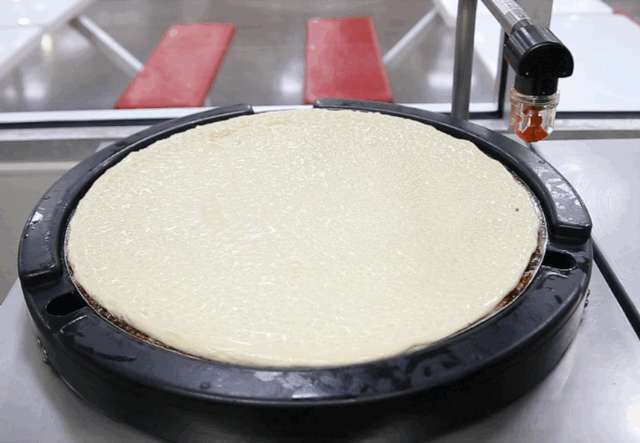 There's a window into every Costco kitchen so that shoppers can see not only the happy, hairnet-wearing employees, but also the majesty of the proprietary sauce machine. 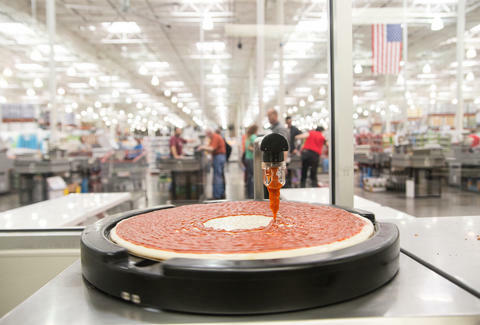 Another part of Costco's pricing ethos is to meticulously measure each ingredient, and the machine ensures that each pie receives the perfect amount of tomato sauce, which is covered all the way to the crust in a mozz/prov blend (24oz for a cheese pie, 12oz for pepp/combo) so the sugars in the sauce don't burn. 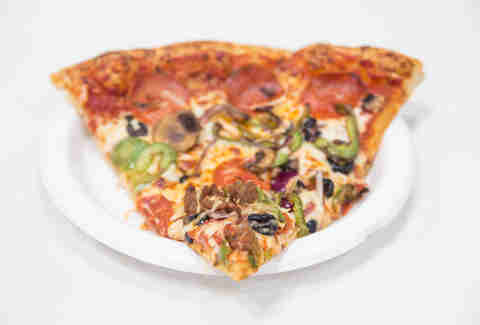 Sure, it's not rocket science to lay down the right number of pepperonis, but Costco dodges the pitfall of haphazard toppings by using exactly 60 per pie, arranged in a four-three-two-one formation with lanes between each of the six pieces to ensure no pepperonis are harmed in the slicing process. Another element of the Costco philosophy is that offering fewer items allows for more efficient supply chains and higher savings. 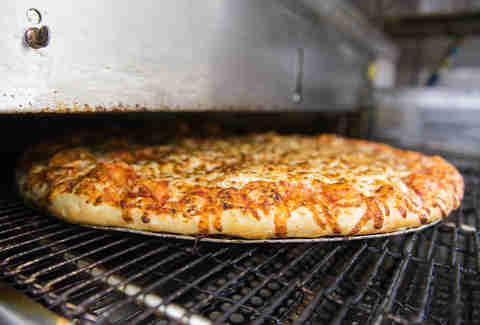 Each of the three types of pizzas has its own conveyor oven timed specifically to create perfect pies every time. The result is a thick-and-hearty slice that clocks in at just over 700 calories. Of course this isn't a wood-fired Neapolitan pizza hand-tossed by an Italian native with extra-virgin olive oil in his blood, but for two bucks it's a damn fine piece of pizza, and an even better one at $9.99 for an 18-incher. And thankfully, unlike most other things in the store, you don't have to buy a dozen of them at once. Dan Gentile is a staff writer at Thrillist. He is soon to be the proud owner of a Costco membership card. Follow him to needless bulk purchases at @Dannosphere.